The only thing more appealing than our beautiful new model, "The Walker" at The Grove, is the location! Set among the trees in Midlothian, this beautiful community is tucked away with easy access to Highway 287 and next to the new Midlothian Heritage High School in the highly acclaimed Midlothian ISD. 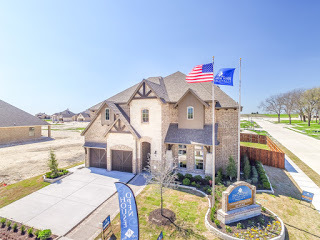 This home and John Houston Custom Home community are a must see! Beautiful, cool, colors run throughout the home and custom wood trim is featured throughout. Dramatic touches like the grand stair case and overlooking Juliet balcony are flanked by an equally impressive floor to ceiling stone, wood and granite fire place. Over the years, John Houston Custom Homes has built countless relationships with the people in the local community in which we build and around the world. Beyond building homes, building relationships is key to all that we do. But our company isn't one person. Our company is many hard working individuals who share in John Houston's vision and recognize and value it's importance to build lifelong relationships. So who are these individuals? From the sale of the home, through the building process, until close and beyond, John Houston Custom Homes is people like Area Project Manager, Justin Bright. Termites: Is Your Home Protected?